California Roadsters is a non-profit, Orange County, California based hot rod club, founded in November 1990 by Duane McKinney and Tom Schauppner. 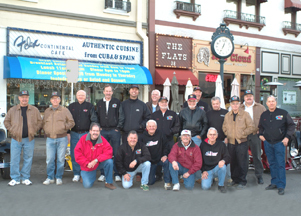 Members can be seen in our black letterman/leather bomber jackets, with hand painted artwork depicting a nostalgic rending of our roadsters, at most Southern California car events. Our specialty car club is limited to American built roadster street rods manufactured before 1937, with our club logo being a red 1932 Ford roadster on a Southern California beach. Although relatively new on the scene, our members have been around cars all of their lives and include an original member of the Knight Riders, which was the successor to the original California Roadsters club; a two time winner of the Great American Race, who is also the owner/builder of “The World’s Fastest Streetable Roadster”, who also competed in the 2005 La Carrera Panamericana, the revival of the Historic Mexican Road Race, with another member winning his class, in a '54 Hot Rod Lincoln. Two current Bonneville racers with several world speed records; and a former offroad racer. 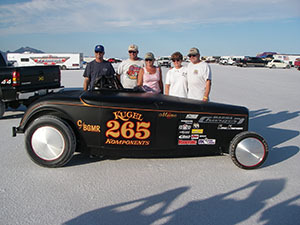 The Jerry Kugel Family have salt in their veins, with a long history as Bonneville Racers, and have continued the tradition of a CR member owning/racing “The World Fastest Streetable Roadster”. They debuted the 265 C/BG MR (Blown Gas Modified Roadster ) in 2008, by driving it from their shop in La Habra to Bonneville, and then converting it to race gear and going over 200 MPH. During the 2008-2009 August meets daughter JerriLynn turned a top speed of 216MPH, son Jeff at 223MPH and Jerry at 225MPH. 2010 was an off year with the engine going sour on the first run, but they returned in 2011 with granddaughter Jordon turning 205MPH..
Additional current/retired members include the current Editorial Director of Street Rodder Magazine, a former Top Fuel owner/racer of a front engine blown Hemi dragster before they were considered nostalgic; a former Prostock owner/racer; a former owner of a NASCAR team; several former dry lake racers; a past winner of the World’s Most Beautiful Roadster at the 1993 Oakland Roadster Show; three winners of the annual Goodguy’s Stroker McGurk award, and a former nostalgic sprint car racer. 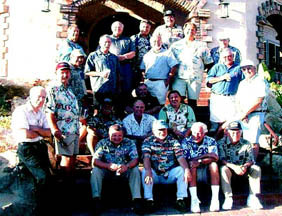 Several current and retired CR Members are accomplished writers including an international auto journalist, published in several well known magazines, and former director of the Petersen Auto Museum; another is a former writer for Hot Rod Magazine and now writing for a local drag racing magazine. All members of the California Roadsters own a minimum of one Ford roadster, but most of the guys own several street rods and/or classic automobiles. It’s not just a hobby, but an obsession that has just recently been recognized as a part of automobile history at the prestigious Pebble Beach Concours de Elegance, with one of our members as a judge. In the 1950’s the hobby evolved into drag racing, with the first drag strip in the nation being the Santa Ana Drags, with one of our members working this event. This small strip was the predecessor to a number of drag strips in Southern California, with only the Pomona Drag Strip remaining. Everybody loves old cars, hell it’s Americana; but how many guys can build a rod to their own personal specifications, that doesn’t look like every other ride on the road, and have the fun of driving their own creation. The guys in California Roadsters have fulfilled that dream, and will continue to drive their roadsters at every opportunity.